Another bunk bed design, this one based on interim Autobot leader Ultra Magnus. His car carrier/transport alt-mode is ideal for a bunk bed configuration, with the truck cab being used for storage. If you want to take this idea even further, you could park a few car beds on it (both given an Autobot makeover of course), but that would require an even bigger Ultra Magnus. 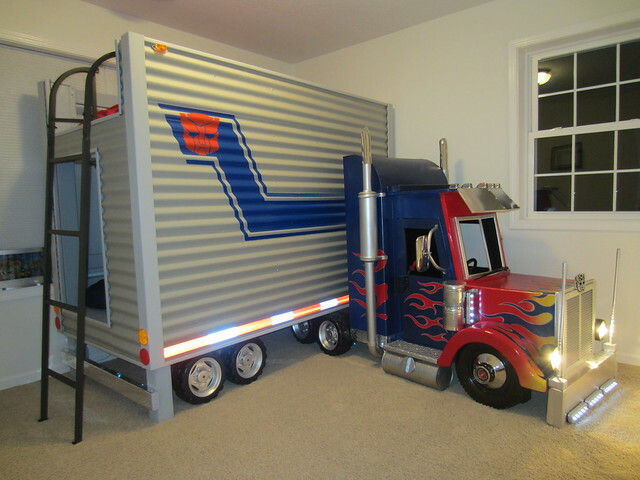 Side note: here is a cool Optimus Prime bunk bed that was made for a couple of lucky rugrats. How can I buy the optimus bed? Is there a website to order it from? where would I be able to get a bunkbed like this. How much? It’s absolutely amazing!! My boys would love it as they all love trucks and my husband drives truck. So this would be a dream come true for them! Where can I get this bed! Please email me! I have a 5 year old and a 3 year old. They both eat, drink and sleep transformers. They would absolutely go crazy if they cane home to this in their room. If someone could email me the website where it could b purchased or even the specs on how to make it. Thank you so much. I would like to buy the Optimus prime bed please let me know how I can do so. My boys are 6 and 4 and my husband is a truck driver they saw this bed and asked for it. Please email me back at vmontalvo84@yahoo.com and let me know how to purchase one, if they are even available for purchase and if there is a website we could go to. Thank you in advance. Sorry this is just a design, I don’t make or sell actual furniture. For all those asking: contact a custom furniture maker for a quote (it’ll be pricey): I would contact Tom Spina Designs (www.tomspinadesigns.com) or AFX Props (http://afxprops.com/). Hey i would like to know where can i get a optimus prime bunk bed.. I have 3 boys under the age of 7.. They love the transformers.. They even watch the old school tv. Shows.. Also their father is a truck driver.. Please contact me..
Hey i have a 6 year old i would like to know how much is for the Optimus prime ? Just saw this for the first time. Initial design addition…have that grill on the front of the truck cab be the back of a desk chair (it fills a cut out) and have the face of the cab and bumper open up as one piece flat to the wall to reveal a work desk in the cab that has lights that come from Optimus’ folded down head which would reside on the inner ceiling of the cab. Just a thought as I love creating designs as well.